Q: Who do we Wai? People with lower social status wai first i.e. Younger people wai older people first. i.e. 2. We don’t wai anyone who we are paying for service such as waiters, tailors, vendors, shopkeepers or taxi drivers. And presenting a slight bow with your body. The index fingers touch the tip of your nose. Nowadays, Thai people do the wai to superior or older person by putting the hands on the chest level and slightly bow the head. We don’t wai people at your own age anymore!. Q: Do we Wai back when someone Wai us? – It is not necessary to do the Wai back, especially when we are being wai-ed by anyone who we are paying for service such as hotel staff, waiters etc. We usually just nod, smile and say สวัสดี hello or ขอบคุณ thank you in response. However, in my opinion it is nice and sweet when someone wai us and we do the wai back i.e. when my little borther’s friend Wai me, I like to response by doing the wai back to them too. In case you want to do the Wai in return, you can simply just put your hands together at the chest level and say ‘sawatdee ka/krap’ สวัสดีค่ะ. Don’t need to bow. 1/ Does a mother wai her son if he becomes a monk ? 2/ Does adults must wai the children monks ? 3/ Does the king and the royal family must wai the monks ? 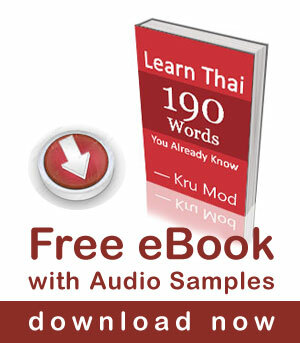 Sawatdee k Julien, thank you for your questions. 2] Some people wai young novices and some don’t (In Thai, novices are known as a “สามเณร samanen” or just “ เณร nen” for short) The main difference between a novice and a monk is that novices observe only 10 precepts while monks observe 227 percepts. 3] Yes they do respect monks and also wai them. Thank you and Pear for this video. My wife and I watched this together. We were in Thailand March/April. We enjoyed Songkran very much. The people of Bangkok, and especially of Ko Kret were so very friendly. They made me drink much whiskey and fed our family so much !!! They left a very warm place in my heart. We had many opportunity to wai and we really appreciate understanding better how to wai. Our little Granddaughters in Bangkok are 3, 5, & 7yrs old (a one year old Grandson too) and they wai to everyone and many give them sweets, especially the old ladies! 🙂 Now we will wait for them to wai to us first. Thanks for the great informative videos, love your website. Thank you. I wasn’t sure how to Wai my Thai Boxing instructor. Now I do. Awesome lesson. Thank you again, ladies. Can I ask why you do not use the wai to greet children? If a child wai me, I should not wai back? Very usefull information! Although, I have a question. I have heard that sometimes women also slightly kneel while greeting their superiors with wai. I’ve seen the girl students do it to their teachers, but how about the adults? When i have the opportunity, i will go your country to study at there . because i always dream live there , I have ability study . i truly am interested you video so much about action when you teach . Good you are back with new videos. Hi Kru Mod, long time since I have not interrupted your classes. I think there is also a small “background” between men giving wai to a woman (about same age and same social status). Is it right that men have to wait the woman to wai first? Sawatdee ka Ajarn Greg, apologies for my late reply. I have never heard of this before. Gender is usually not used to consider regarding the Wai. Your lessons, whether they teach something new or help learn to do something better are always enjoyable and well done. Thank you. Thank you for your lovely lessons, my fiancé, Katay, loves it when I try new phrases on her. She says I’m getting more Thai every day! Your lessons are the best! Thanks Mod for a great lesson on the way things works in Thailand ,regards to you. Mod you’re always impeccably dressed.